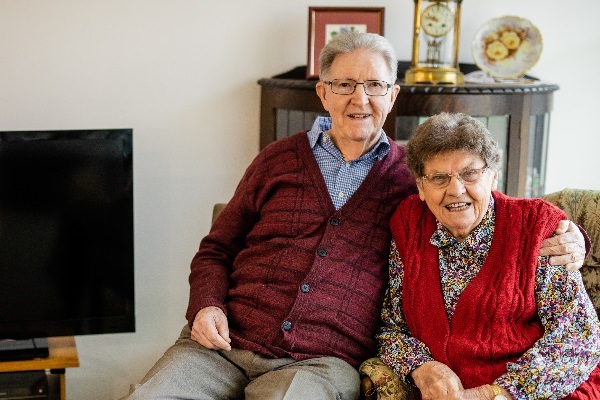 The traditional anniversary gift to celebrate 60 years of marriage is a diamond, but when Dr Peter and Mrs Joan Swain got engaged more than six decades ago, his proposal and her diamond engagement ring came through the post. This is their unusual love story, which still continues as they share their lives at Peninsula Village. Back in 1952, Peter was an Aussie working in Melbourne in the insurance industry and Joan lived far away in England. At that time, Peter was encouraged by church friends to become a Methodist Minister. Assured that this may be God’s will for his life, he enquired about the years of study involved, getting degrees at Melbourne University. First, however, he would need to spend a year of preparation and pass exams in preliminary subjects, including Hebrew, as an Arts degree had to include a foreign language. Peter got cold feet, feeling that he did not have enough academic ability. Like Jonah he escaped overseas. With a mate, he went to Europe by ship, taking his motorbike to see the sights. He arrived in London with only five pounds left, so immediately got a job selling Walls Ice Cream at Wimbledon. On Sundays, he began attending the large Methodist church in Westminster, where he met Joan Grenyer, a lovely Dorset girl who worked as a shorthand-typist at Lloyd’s Bank in Pall Mall. “She stole my heart,” said Peter, and as a couple they started going together. In 1953, they were in the crowd in London watching the procession at the Queen’s coronation. Peter hoped to marry Joan, but in mid-1954, he decided that he’d have no peace unless he tested God’s call to ministry. It took courage to tell a tearful Joan that he must return to Australia. They agreed to keep in touch by correspondence and if their love survived another couple of years she would emigrate to join him in Melbourne. In July 1954, he sold his motorbike and reluctantly took ship for home. Friends and family doubted whether their love for each other would last, being separated on opposite sides of the world. For two years they exchanged fortnightly letters with thoughtfully worded messages of love and tales of their lives so many miles apart. Then in early 1956, Joan said she was ready to join him in Melbourne, so Peter mailed a letter of proposal of marriage to her and one asking her father’s approval. After they replied “Yes” he sent Joan a diamond engagement ring in a tiny package by registered post. She was notified when it was ready to collect from British Customs. She caught a bus there one lunchtime, paid the import duty and received the package. Then, sitting alone upstairs on a red double decker bus, she put the diamond ring on her finger and got engaged! About mid-afternoon her workmates noticed the ring and there was a great celebration! With faith and hope she made plans to sail Down Under. Joan was given migrant status and in July 1956. As a “ten pound Pom” she sailed for Australia and Peter. There was a joyous reunion, but they couldn’t immediately tie the knot! In those days, Methodist discipline with probationer clergy was tough and Peter was not allowed to marry until he completed his BA. This meant another two years of waiting, but at least they could spend weekends together, happy that their feelings were unchanged. On 6 December 1958, a few days after Peter finished exams, they at last got married. Ten months later their first child Sue was born, with daughter Kate and son Brin soon to follow. Their initial church appointment in 1960 was to Murrayville in the outback Mallee in Victoria in a Methodist-Presbyterian united parish. They loved country life. Joan joined the Country Women’s Association and one fete day was awarded the “Mrs Murrayville” title – the trophy was a butter dish! Peter played in the dance band and drove the ambulance. Two years later, unexpectedly, the Church appointed Peter to be a school chaplain. From 1962 for the next 35 years, he worked in this role, serving in three schools – Wesley College Melbourne, The Leys School Cambridge UK, and Newington College Sydney, where he was also the Archivist and College historian, writing three books about the school. Being new to teaching he was advised to study Education. By then, he had no cold feet! Over the years he graduated BA, BD, GDipEd, BEd, MA, and then, after 6 years work, the Doctor of Ministry degree. After typing many earlier essays, Joan typed his doctoral thesis on Education in a multi-faith, multi-ethnic school. Most of Joan’s time was taken up with home duties and care of their children, but after they were all at school she was able to work again as a secretary, including in the Headmaster’s office. Occasional trips to England, especially their time in Cambridge, were special for her, as she was able to visit relatives and old friends. Peter was also a part-time chaplain in the Australian Army Reserve. He served for 20 years and was awarded an Australian honour - the Reserve Force Decoration (RFD). In 2005 he was invested with an Order of Australia (OAM) for services to the Uniting Church and Education, including as National President of the Australian Association for Religious Education. Having holidayed on the Central Coast and liking the area, they moved to Umina Beach after retiring in 1996. They joined the local Uniting Church and Probus Club, and having a good doctor and dentist and many friends, they wanted to live out their lives in the area. In 2016, they moved into a two-bedroom couple’s unit in Peninsula Village. One room is Peter’s study where he prepares occasional services for the church and the Village. “We are surrounded by kind friends and we really love the lifestyle at the Village. We can remain together for the rest of our days, as this is a first-class facility with good staff and excellent on-going care,” they said. This year, they celebrate sixty years of marriage, with children and grandchildren whom they say they love and admire. These are two lives very well lived, with more fruitful years to come with the support of a secure and supportive home at Peninsula Village.